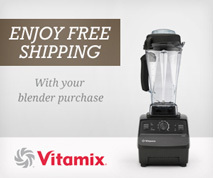 A Vitamix blender makes smooth soups easily. 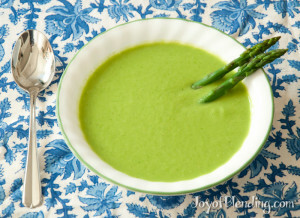 This is a similar idea to the broccoli soup that I posted a while back, but this time I used asparagus. We’re well into asparagus season, so if you want to try this before the good asparagus runs out don’t delay! I’ve taken to steaming the vegetables, and then blending them with the steaming water in the Vitamix. You can substitute a variety of vegetables. This is a vegan recipe, but you could obviously use some cream if you so desired. Makes ~5 cups asparagus soup. I’ve found that you can slightly multitask to expedite making this. Here’s my method: start a little more than 2 cups of water boiling in a pot that you have a steamer insert for. * As it’s heating, peel the onion and garlic and coarsely chop them. Once the water is boiling add the onion and garlic, and start a timer for 5 minutes. While those are cooking wash the asparagus and trim off the tough bit on the ends. ** At 5 minutes add the asparagus and start the timer again for 5 minutes. If you have skinny asparagus you should go for less time—you don’t want to overcook it. Note that the onions and garlic continue to cook as you are steaming the asparagus. Once the vegetables are cooked remove steamers from pot and, measure out two cups of the hot steaming water into the blender and add the vegetables along with the remaining ingredients. You can reserve a few asparagus spears for garnish if you like. Blend on high until smooth, ~45 seconds. You can run the bubble removal trick if you like, then serve! I know most soup recipes with onion call for sauteing the onion, but I ran a taste test that I described in my broccoli soup post and found that I don’t think sauteing is necessary. Even with the 10 minutes of steaming time, this recipe comes together quickly, and I find it satisfying. I’ve also made this with other vegetables like mushrooms and zucchini. *If you don’t have a steamer insert, you could just add the vegetables to the water and cook them for a little less time. The pot I have looks like this one. It has a pasta insert that I put the onions and garlic in, and it has a steamer basket that I put the asparagus in, so it effectively becomes a double-layer steamer. **One common rule of thumb is to find the place where the asparagus breaks naturally and discard the ends. I’ve found that if you do this you end up wasting a bit of asparagus. Especially for a soup like this where if something is slightly tough the Vitamix will still smoothly puree it. I usually take off half an inch to an inch depending on how the asparagus looks. A conjunction of “what would be easy for dinner?”, asparagus in the fridge getting no younger, and joyofblending led to a delicious meal. I liked the idea and taste of the boiled onion and garlic. And I included the brewer’s yeast as well as adding turmeric and hot paprika. Yum. Asparagus (steamed, as in this recipe) also makes a really nice cold soup, using ice cubes instead of the hot water. For the cold version, you can also add avocado, which goes really nicely with the asparagus. Whoa, I would not have thought of that! I like and use Better than Bouillon but curious why not use the soup stock/broth in the cartons instead to steam/cook the veggies and than place in blender? There’s nothing wrong with using stock. I use Better than Bouillon because it’s convenient, economical, and tastes good to me. You could also make your own stock and freeze containers of it—that would probably have the best flavor. I made this soup using the cashews and it was the best soup ever. I put the onion and garlic in the steamer and then added the asparagus. I put the steamed asparagus, vegetarian bouillon and cashews and water in the Vitamix and blended it as above. Did not use the yeast. Unbelievably good! It made two awesome bowls of soup. Is it necessary to steam the asperagus? Broccoli soup also calls for steaming but I just toss frozen broccoli in the Vitamix and I love it! I haven’t tried using raw asparagus, but I don’t see why you couldn’t. The one thing I would warn you about is the onion. Unless you have a very unique sense of taste, the onion should be cooked, (or if you don’t want to cook it you could put in a very small amount). Add a nub of ginger, a SMALL slice of lemon (with rind) and 1/2 a teaspoon of margarine into the blender with the other ingredients. I just got my new Vitamix. This is a first for me, making this soup. It was very good. The only thing I did different was use pecans. I have pinned the Broccoli & Mushroom/Cauliflower soups to try next. Thank you!? I STARTED JUICING IN JAN BUT THIS VITAMIX DOES IT ALL. CAN’T WAIT TO RECEIVE IT.